January 27, 2016 (Ramona) – Three award-winning Ramona Valley winemakers were presented recognition certificates from Representative Duncan Hunter at the monthly meeting of the Ramona Valley Vineyards Association (RVVA) on Tuesday, January 26th as an indication of the quality and growth of the winemaking industry in San Diego County. Duncan Hunter has represented San Diego County in the U.S. House of Representatives for seven years and is co-chair of the Congressional Wine Caucus. The wineries receiving the recognition include Ramona Ranch Winery, Altipiano Vineyard and Winery and Lenora Winery who won top honors at the Santa Rosa, CA-based Vineyard & Winery Management’s 25th Annual Grand Harvest Awards from a pool of nearly 1500 entries submitted from throughout the United States and as far away as New Zealand. These awards join a growing list of more than 200 medals received by members of the RVVA wines at competitions throughout the U.S.
Ramona Ranch Winery’s Tannat was awarded best-in-class and double-gold. Sangiovese Reserve received gold, Merlot and silver. Altipiano Vineyard and Winery was awarded silvers for two Sangiovese wines and a bronze for Merlot. Lenora Winery was awarded silvers for Dessert Wine and Sauvignon Blanc Blend and bronze for Cabernet Sauvignon All three wineries are members of the Ramona Valley Vineyard Association (RVVA), founded in 2001 and dedicated “to promote, protect and enhance the Ramona Valley American Viticulture Area (AVA), our wines, vintners and community.” Largely responsible for securing the federally designated Ramona Valley American Viticulture Area (AVA) in 2006, the RVVA continues to focus on community, education, sustainable operation of vineyards and wineries and taking a leadership role within the San Diego County wine grape industry. Based in Santa Rosa, Calif., Vineyard & Winery Management is an independently owned and operated multimedia company that produces an international wine trade publication, conferences, trade shows and wine competitions. The family-owned company publishes Vineyard & Winery Management magazine, which has the highest circulation of any North American wine trade publication. V&WM's conferences and trade shows include Craft Beverages Unlimited East and Craft Beverages Unlimited Midwest. Its wine competitions include The Press Democrat North Coast Wine Challenge, the Grand Harvest Awards, the East Meets West Wine Challenge and the International Women's Wine Competition. See www.vwmmedia.com for more information. Altipiano Vineyard and Winery is located in the Highland Valley Region of San Diego County between Ramona and Escondido. Winemaker Denise Clarke co-owns the winery with husband Peter. They feature several Estate and locally grown varietals which include Brunello Sangiovese, Sangiovese Blends, Barbera, Super Tuscan, Merlot, Cabernet Franc and Pinot Gris. 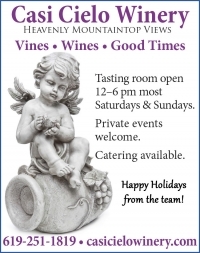 For additional information, go to http://www.altipianovineyard.com . 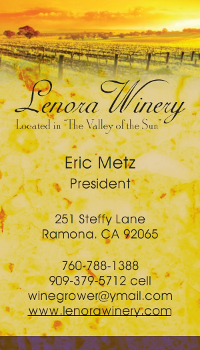 Lenora Winery has been serving the local community since 1999 and is the second oldest winery in Ramona. Lenora Winery is a family run vineyard of five acres located in the picturesque Ramona Valley in the heart of the Ramona Valley American Viticulture Area (AVA. They feature over 25 red, rose, white and dessert wines made from their own grapes that include Cabernet Sauvignon, Merlot, Sangiovese, Chardonnay, Muscat, Sauvignon Blanc, Zinfandel and Grenache as well as blends. Their picturesque estate home overlooking the valley affords outdoor and indoor tasting. For additional information, go to http://www.lenorawinery.com . Ramona Ranch Winery is a boutique winery located on Highway 78 in the heart of the Ramona Valley AVA (American Viticulture Area) co-owned by Teri Kerns and Micole Moore. They produce wines from grapes from Estate and local vineyards and offer both white and red wines, including the recently released and award winning Tannat red wine, Sangiovese, Merlot, Syrah and a light red Montepulciano along with white wines, Viognier and orange Muscat (dry), rose, and dessert Sauvignon Blanc. For additional information, go to http://www.ramonaranch.net.